Was fun this morning. Tourmaline then up to Grand Platiere and down Serpentine. Snow cover thin though. Need some fresh stuff soon. Les Carroz, Flaine & Morillon today, mostly hard packed snow/ice with artificial snow on top. Lovely weather today so had a nice time but what it really needs is a big, snowy storm to dump 6 inches all over it. clouds rolled in today, flat light until early pm. decided not worth the cost of a lift pass to go up. freezing level above the Hameau, suspect the pistes getting carved up. the offpiste won't have improved from friday when we skinned up to Bellevarde, west of the Aosta drag. hard icy patches and a few loose patches of powder up high, mostly ice on the route back down. SCGB offpiste week will have their work cut out! Thank you. Very helpful. Don’t think we’ll be heading there then! Trying to find somewhere with an easy transfer from Geneva with some decent snow..... like trying to find a needle in a haystack! Slightly off the topic of snow conditions, but can any of the Flaine residents or afficionados recommend me a good shop in which to buy ski boots? I am in the market for a new pair and thought I might get them in resort next visit. As a two-week-a-year recreational piste skier I don't need anything fancy or very advanced, but I'd like somewhere with good customer service and who care about getting a proper fit. At various times past I've used InterSport and Go Montagne (i.e Twinner) in Foret as well as Skishop Helios for ski rental and/or servicing and waxing and been very happy with the service from each of those. Also used the Ski 2000 place in the Foret shopping centre (but was less happy with them). However I have no idea how any of those mentioned rate for boot fitting services. A search through existing posts doesn't yield anything on this exact subject but CEM does mention incidentally in one that he once trained the staff in Blackside (down in Flaine Forum) in boot fitting and found them to be good guys, so that might be my first port of call. Always value the updates on this thread in the run up to each holiday - so thought I’d post an update from someone who is just grateful to be on skis at all! Although I appreciate its not the foot of fresh powder you’d all like, however an unexpected couple of CM seems to have fallen on Samoëns overnight - colder too today, so the cannons have been going, a lot of the runs are open and so it’s really quite lovely in this bit of the Grand Massif today! Allegedly Mt Blanc creates her own snow in the area, but maybe the wind is in the wrong direction for the GM, any "locals" care to comment? @dswordsmith - thanks. Going to Flaine for the first time on Friday for 4 days. Just glad to be on skis but must admit I was hoping for some good snow and empty pistes; especially as I've picked Flaine for its early season snow record - ah well!!! Lets hope Mont Blanc works its magic!!!! both bergfex and j2ski both indicating snowfall next week for flaine, which is a change from what was on there yesterday. I'm keeping everything crossed for something to fall before our arrival on the 12th. On way home now, but yesterday was better, temps dropped about 5deg. Flaine bowl wasn't bad, icy in patches as you'd expect. Samoens has really thin pistes , lots of rocks and grass starting to be visible in the higher slopes without cannons. Colder weather has allowed the pisteurs to work their magic lower down , artificial stuff much better than couple days back, times like these you realise what an amazing job they do to keep the pistes open and decent. The sides of the pistes below 1400 odd are brown. 12z and 18z on GFS both had little bumps of snow around the 9th, still there in this morning's, although for some reason the midnight run is missing, it wouldn't take much for it to either go nuts or disappear, so like you, everything crossed! Depends if you are an early riser and the kids have the legs to be able to ski over to Flaine and back again before ski school. Some can do it, but if it is school holidays then lift queues might well get in the way? I think you'd struggle to get over there and do some decent skiing in the 14.55-17.15 slot. When are you going? 09-16 Feb, so Scottish school hols and some french, but not English (I think). Yes, we are early risers and girls are pretty tough but wouldn't want to be busting a gut just for the sake of it. @trmacc, I see, so might be worthwhile? Also ask the ski school what pass level they want. Depending on the kids levels and weather they may well take them over to Flaine anyway, so might help with your decision? thanks @Cheesie168, that's a good idea, I'll contact the ski school. My older daughter is going to be in Etoile Or or something so I would imagine they will be covering some ground. @trmacc, yes, reckon that if she is on Gold Star then they will likely head to Flaine for the early days to test them on various slopes/snow conditions before coming back to prepare for the slalom speed trial. Might be worth letting the ski hire place know, so you can pop the skis back in for a quick wax before the speed trail. @Cheesie168, again good advice. She has her own skis but will sort out a wax before the speed trial. We’re heading to les carroz in 2 weeks. We’ve not been for 2 years and I can’t seem to find transfers for under 225 euros for a return for me and my wife . I’m sure it was half that last time we visited. Hmm. Flying out 12th for a few weeks. Was looking into maybe doing a ZigZag Off piste 5 day thing. Could be it too optimistic at the moment from anyone that's out there? Haven't yet paid for it. @MoonfireSpam, Zig Zag always seem to find good areas and challenges no matter what the snow conditions. Not doing it this year but two friends have signed up. In Flaine at the moment enjoying some dec3nt skiing. It's nowhere near as bad as I was expecting. The temps are around -5 at 2500 and -1 in the village, keeping the in decent condition. On Saturday it was bluebird and yesterday it was very cloudy half way down and clear on top. It's threatening to snow but nothing yet. Rocks have been mentioned; I've seen couple but it's not an issue. It has been busy though with the last of the NY people so some crowded pistes especially on the serpentine. Carroz, Morrilon and Samoen by far the quieter. Thanks Gaz_H for that update. hoping for more snow before we arrive on the 12th and hoping that the NY skiers have gone home. Are most of the runs open in Flaine?? I keep checking on the Grand Massif website and not all look open?? About 60% open. Tbh, I've been spending most of.my time on the Carroz side. I don't think there are any blacks open in Flaine. The Veran (sp) sectour is mainly shut. Early return today, knackered! Quietened down a lot now. Bluebird day again. -6 Morning great but mid afternoon snow v hard in places; I'd say Samoen is the worst but still enjoyable....it's skiing after all!! How do I post photos?? Thanks for the updates gaz. 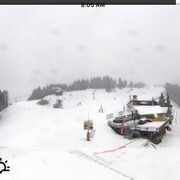 It's snowing in Flaine! Just woke up and the village road are covered. Might not be that deep but it's still snow! Last day too.....nice! Webcam pic below of the main lift up from carroz village. Definitely fresh snow on the floor of the seating area. We arrived in Les Carroz last night and there had been a little snow during the day. Overnight there has been more and it is still snowing steadily, probably about 10cm at village level since we arrived. Still unpacking and doing apartment jobs, so not sure we'll make it up the mountain today, but will report back once we have.